When Bobby became the Head Coach for the wrestling program at Sunnyside High School in 1992, he came into one that was very successful and well known. The new coach continued that winning program and made it even more remarkable. Because Sunnyside High School has established itself as one of the best run programs in the entire United States the school is listed as a “NATIONAL DYNASTY” by Wresting USA Magazine. Sunnyside’s records speak for themselves. The school has recorded 506-wins to 6-losses since 1976; piled up 24-Team State Championships; 4-Team State Runner-ups and 107 Individual State Champions. Since Bobby has been there, he has won 7-straight Team State Titles; had 46-All Americans; 44-Individual State Champions; and over 200 State Place Winners. The success of the team is due to dedication and support from the families of Sunnyside where entire families will play for coach Deberry and then come back to help support and train the team. It also comes from his good relationships with his assistant Coach, Manny Martinez. In 2002, Bobby was named the Regional Coach of the Year and Manny was name the Regional Assistant Coach of the Year. That same year, Manny was named the National High School Assistant Wrestling Coach of the Year. 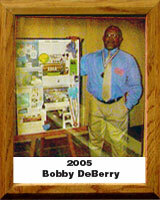 In 2004, Bobby was named by the National Coaches Association The NATIONAL COACH OF THE YEAR. Still actively coaching, and still earning many accolades and awards, Bobby is constantly on the road taking his players to tournaments around the country as well as helping at camps and clinics in communities around the U.S.